Enough bad news. Turn off the newsfeeds, get outside and breathe. It’s Labour Day as I write this. There’s an irony in that. We get a day off to celebrate…going to work. Perhaps that’s fits our modern meat-market “human-as-resources” reality: more people working longer hours for less pay at crappier jobs. That’s us. It’s worse in the States. Even though the economy is running flat out and unemployment has dropped to new lows. I was walking home the other day when someone called my name. I turned around but didn’t recognize the guy. He introduced himself, then told me his long-deceased brother had been my best friend in grade school. We chatted for a while. He’s an electrician. As we talked he supervised a young guy working in a trench. He told me that it’s hard to get kids who’ll work hard these days. They don’t have the same work ethic, he complained. The conversation drifted into all kinds of messy corners: the Walmart economy, stagnating wages, the fact that young people no longer believe they can achieve their parents’ level of comfort in life. “The changes I’ve seen,” he said, “I wouldn’t have believed it if someone predicted them years ago.” I didn’t have any answers. He complained that kids coming from India and Asia work harder than our own kids. I thought: our kids are demoralized. But I realized that the kids coming from overseas are the very brightest, most ambitious and hardest workers, and from reasonably well-off families. They’re the privileged few. It’s unfair, I thought, to compare a whole generation of our own kids with these few. We’re living in distinctly demotivational times. My friend’s brother was right. The world is not like it used to be. The news media has a lot to do with it. News is now totally global—to a degree. We see the flooding in Houston as it’s happening on live feeds. But it’s also tightly edited for the American audiences. We don’t get to see the people suffering through similar disasters in other countries. 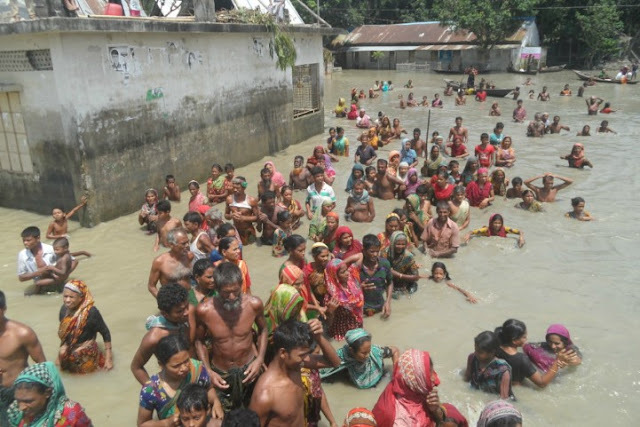 Like the 16 million children in Nepal and Bangladesh who’ve had their lives swept away in continuous flooding from torrential monsoons that have been inundating the region since mid-August. The UN reports 1,288 deaths, and estimates that 45 million people have been directly impacted by the floods. To most Americans these are only numbers. American news only covers America. Unless it’s a US war zone. I know there’s bad news. And it can affect us personally. Our daughter just drove west through BC, along a road just 100 kilometres away from a raging forest fire. I have friends suffering from respiratory problems due to smoke from forest fires consuming the BC interior. There’s not much I can do about it. Yes, the weather is getting worse. I’ve been writing about it for a decade, and people have been warning us since at least the 1980s. It’s not news. It’s reality. The future “new normal” is likely to be much worse. Some things will get better, innovation and technology being what it is. If you have the money to afford it. I check my newsfeed less frequently these days. I get a sense of what’s going on in the world on any given day. I haven’t watched any television in at least a month, and that even includes Netflix. I’m spending more time at work, and more time in the real world talking face-to-face with friends and co-workers. When I do spend time alone, it’s mostly on creative projects or getting outside for long walks before the cold weather hits. I can’t say that I’m in a better frame of mind, exactly. But I can say that I’m less worried about the next generation and the future of the planet. It’s too big for me, just as it turned out to be too big for my parents and grandparents. My grandfather told me that, before I was old enough to know what he meant. I am confident my kids will do just fine, all bad news to the contrary. The best we can do for our kids is to give them hope and inspiration to go ahead. Tell them there will be a 22nd Century, and they’re the ones who will be leading us there. And I, for one, think a few of them already know that better than we do. "It's too big for me." That's such a poignant, honest comment. And so true. I feel it too. It's all too big for me. I can't fix it; I can't help it. After that, then, I must ask myself, so what is the recourse? The answer? Of course I don't know, as I try to do my little bit, with donations, etc. The news has this way about it...it's like a trainwreck for me: I can't look away. But you are right. I should get out and breathe more.